Report Nigel Cannon / Photos William Macey. 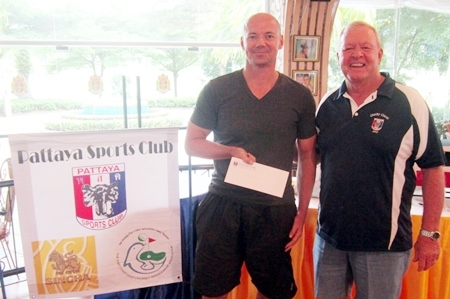 This month’s tournament was at the ever popular Green Valley Golf Club on Friday, July 19. Unusually, a shot-gun start was agreed with the buffet and presentation in the clubhouse after the rounds and the calculation of the results. There was a field of 116 which should have been 120 but some members had location problems! 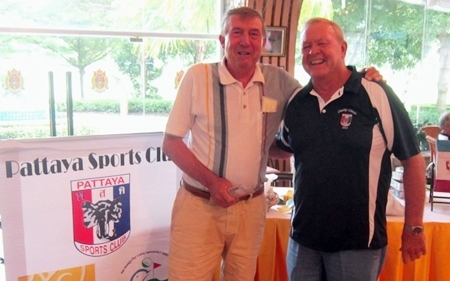 Andre Coetzee – Low Gross winner (left) with Golf Chairman Joe Mooneyham. As this was a 10.30 a.m. start it meant all players arriving around the same time however with the experience of Golf Chairman Joe Mooneyham and Social Chairman Nigel Cannon, together with the efficient administration of the PSC office staff, all registration went smoothly. The course was in its usual fine condition despite heavy overnight rain. It was perfect weather for golf, not too hot with a little breeze and all rounds completed in a little over 4 hours with some excellent scores submitted. With all cards coming in together it was Joe, Bob Linborg and Nigel calculating the results and noting the technical winners. 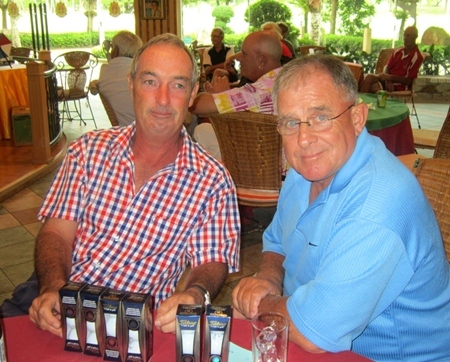 Eddie Beilby (left) – 50/50 winner. It was a new face for the low gross winner with Andre Coetlee (7) taking the honours with 76 gross. 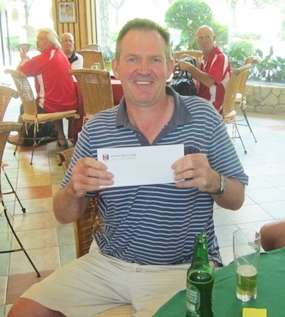 A Flight played stroke play and saw Paul Heyworth (9) claiming top spot with 69 Net. 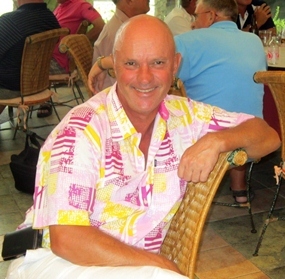 The best Stableford was the ‘B’ Flight winner Dennis Pelly (12) with a fine 43 points. Thirty nine points from Michael Jeffreys was enough to win ‘C’ Flight as was 40 points from Ed Hutchins (28) to take ‘D’ Flight. The Silver winner was Peter Henshaw (16) with 36 points and in the Ladies Flight it was current PSC Champion Ning Neal (11) showing championship qualities with a fine 42 points. Following some refreshment and food from the buffet it was time for the presentation. Nigel welcomed all and introduced Golf Chairman Joe Mooneyham who expressed his appreciation to all who played today and for the help from Nigel, William, Bob and Noy. Joe then gave details of next month’s special Charity Tournament at Siam Plantation on Thursday 15th August, with a shotgun start at 12 noon with presentation and food at the clubhouse. Sign-up sheets are at the clubhouse – limited to 120 and all monies to be paid in advance. Then it was back to Nigel to announce the winners, and Joe to present the prizes. 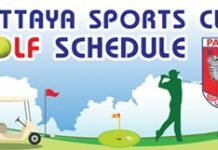 The lucky draw followed and then 50/50 draw with the first 2 tickets winning green fee vouchers for 4 persons at Green Valley and St Andrews kindly donated by Khun Niran, General Manager. The final ticket for the 50/50 was a good friend of PSC, Eddie Beilby. 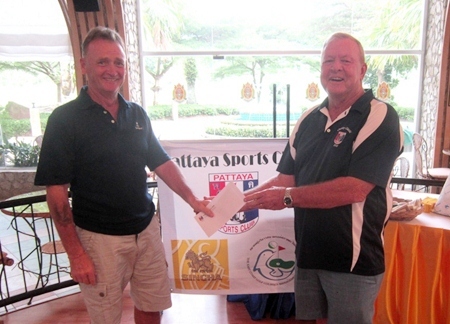 Finally anyone who had not won a prize was given a Sports Day green fee voucher for Green Valley, again donated by Khun Niran. As the members left there were many comments made to Joe on another fine tournament. Ed Hutchins (left) – winner in D Flight. Paul Heyworth – winner in A Flight. Nick Shaw – runner-up in C Flight. Owen & Barry – near pin winners. 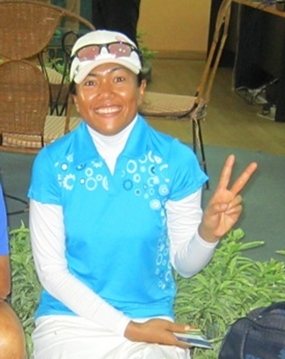 Ning Neal – Ladies winner. Many ladies played and had a good time.